Plaques flank the foyer doors of St. Volodymyr’s Ukrainian Catholic Church. Symon Petliura arrived in Paris in 1924 on the heels of a tumultuous period in the world's history. Having been Ukraine’s first president from 1918 until it fell to the Bolsheviks in 1920, Petliura fled first to Warsaw, then Budapest, Vienna, Geneva, and finally Paris. Hoping to find respite as well as continue to work towards his political, military, and cultural goals, he began a library collection, founded a weekly journal, and oversaw the political activities of Ukraine’s government in exile. In 1926 while on a stroll his stay was abruptly terminated by an assassin’s bullet. Though his residence in Paris was brief, commemorations in Paris to him abound. An old illustration (source unknown) shows the spot where Symon Petliura was assassinated. 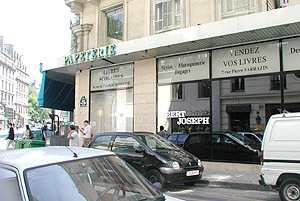 The same corner, Rue Racine and Boulevard Saint Michel, as it looks today. Located in the 20th arrondisement (district) the library which he started continues to exist, getting ready to digitize its catalog and offering occasional lectures as well research facilities to those interested in Ukrainian affairs. St. Volodymyr’s Ukrainian Catholic Church (6th arrondisement-district) has two plaques on display in its foyer – one in French, the other in Ukrainian – memorializing Petliura (see top image). 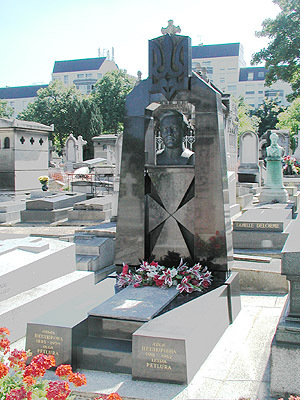 Last, his remains are in the Montparnasse Cemetery (14th arrondisement-district), a final resting place shared by other famous statesmen, writers, and industrialists such as Paul Reynaud, Simone de Beauvoir, and Andre Citroen. 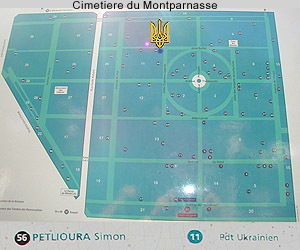 Walking into the cemetery’s main entrance and asking a patrolling gendarme for directions to his grave the polite reply comes, "A oui, le premier president de l’Ukraine. Tout a droite au cirque, apres a gauche a l’Allee Chaveau Lagarde, alors a droite au coin de l’Allee Chaveau Lagarde et l’Allee Raffet. C’est juste a nord-est de la." ("Oh, the first president of Ukraine. Straight ahead to the circle, then to the left to l’Allee Chaveau lagarde, then right to the intersection of l’Allee Chaveau Lagarde et l’Allee Raffet. It is just to the northeast from there.") Along with Petliura, his wife and daughter are interred at the same site. The Petliura monument is located in section 11, #56 in Paris' Cimetiere du Montparnasse. His wife Olga Petlura (1885-1959) and daughter Lessia (1911-1942) are also buried here. 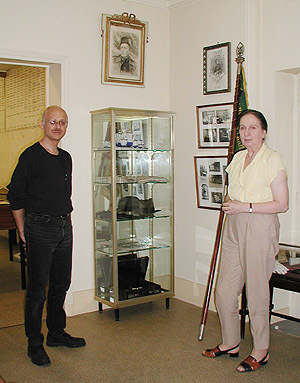 Max Pyziur (Brama) and Daria Melnykovych view a display room containing a collection of Symon Petliura's personal effects. (Bibliotheque Ukrainienne Symon Petlura). Click the map to enlarge. The blue dot at the base of the Tryzub indicates the location of the Petliura monument: #56 in sector 11. 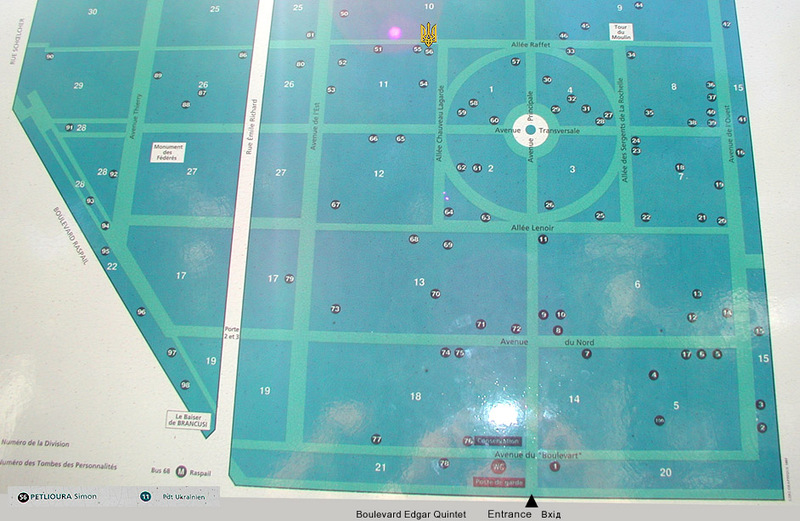 Maps aren't always available as handouts at the gate of the cemetery, so you may want to print out the enlarged image.